MDPI (Remote Sens., Volume 10, Issue 11 (November 2018) – the scientific journal based in Basel, Switzerland, published an article jointly prepared by RusFor Consult Oy Ab, LUT University and Arbonaut Ltd. 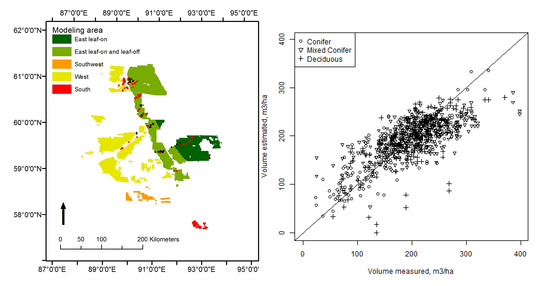 The study considers a forest inventory for the mean volume, basal area, and coniferous/deciduous mapping of a large territory in central Siberia (Russia), employing a camera relascope at arbitrary sized sample plots and medium resolution satellite imagery Landsat 8. RusFor has made a study on remote sensing technique for mean volume estimation obtained using a small-sized unmanned aerial vehicle (sUAV) and a high-resolution photogrammetric digital surface model (DSM). An innovative technology for field measurements (Trestima) was also applied in the research. We came to a conclusion that the UAV and Trestima are reliable and potentially cost-effective means of forest data acquisition with good prospects for operational forest inventory. The study conducted by RusFor specialists compares the accuracy of forest attribute estimates, delivered by airborne laser scanning data, conventional stand-wise forest inventory in the form of Forest Management Plan and Trestima forest inventory app. The measurements are validated by actual results of commercial harvesting, measured and registered by a harvester’s measurement system during logging. Trestima turned out to be the most accurate and effective in predicting preharvest stand characteristics, stand-level-wise. (C) RusFor Consult Oy Ab, 2014. All rights reserved.